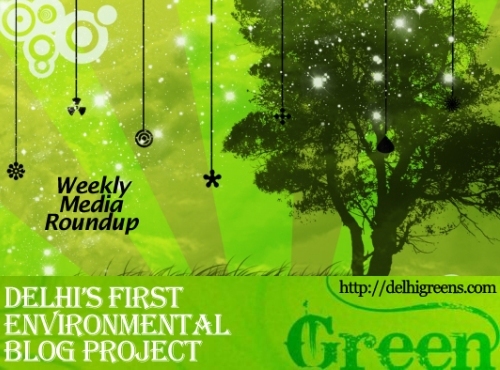 Weekly environmental news roundup from across different media networks for week 28 (starting July 9, 2012) 2012. Delhi Greens, a Delhi-based non-government organisation, holds workshops on ‘Waste to magic,’ where you can learn to make necklaces and invites out of waste paper. Also get fascinating insights into the influences from various eras that have blended into the art and culture that intrinsically resonates in the soul of Delhi. Delhi Greens, a Delhi-based non-governmental organisation, organises trips and excursions as well as events such as workshops. It also keeps members posted (through its blog) on environmental news and activities in the city. In 2007 Delhi was in the middle of its own Chipko Movement. Hundreds of residents were out on the streets protesting the indiscriminate felling of trees to make way for its BRT corridor. Chief minister Sheila Dikshit offered an olive branch to Delhiites, a tree authority with a detailed mandate to preserve the city’s green cover. A month after nearly a dozen peacocks were found dead in mysterious circumstances at Hasanpur village in the Aravalis here, a fresh case of mass deaths has come to light. A report by the Central Pollution Control Board (CPCB) on the Okhla-Timarpur waste-to-energy plant has found several issues of concern, starting with a deviation in technology on the basis of which the environment impact assessment was carried out. The existing technology is a simplified version of what had been mentioned in the project report, leading to questions on the efficiency of the system. Delhi Jal Board on Tuesday approved tenders for new tankers – equipped with smart cards and GPS – to cater to water emergencies, a project pending for the past five years. Terming the municipal corporations as “the biggest polluters” of Yamuna, the Supreme Court today rebuked the civic bodies for saying that they had nothing to do with the pollution of the river. It warned that all its three commissioners would have to appear before the court if it persisted with its stand. In 1999, Singapore was sending 0.76 million tonnes of waste to its landfill site in a year and incinerating 2.04 million tonnes. In 2011, only 0.2 million tonnes was sent to the site while 2.66 million tonnes was sent for incineration to its four waste-to-energy plants. The plants process around 7,600 tonnes of waste daily and produce more than 40 MW of power. 9. Helping birds fly again! Nadeem Shehzad’s house in a narrow, winding lane of Shah Ganj in the Walled City doubles up as a hospital for birds. Shehzad, 34, rescues injured birds from across Delhi and the National Capital Region, provides them medical treatment at his house till they are fit to fly again. The proposed multi-crore Renuka Dam project, primarily aimed at supplying additional drinking water to Delhi, crossed a major hurdle on Tuesday as the National Green Tribunal granted the Himachal Pradesh government clearance to complete the land acquisition process and compensate the affected families. In April 2010, a radiation leak at Mayapuri claimed one life and injured seven people. Two years on, there is little awareness about Chemical, Biological, Radiological and Nuclear (CBRN) emergencies, say experts. Recently, National Disaster Response Force recovered 150kg of a hazardous chemical near Ganga canal in Modinagar, UP. NDRF officials say the chemical — used in insecticides — was dumped a few metres away from the canal. 12. Govt’s dilemma: Security of rare bird or of nation? It’s a case of national security versus one rare endangered bird and some absurdity. The Indian Coast Guard wants to set up a radar installation and a diesel power generation station on Narcondum – the eastern most island of the Andaman and Nicobar Island group. The island is the only home for the endangered Narcondum Hornbill of which only about 300 remain. South Indian actors started donating green plants to the green plant farms.